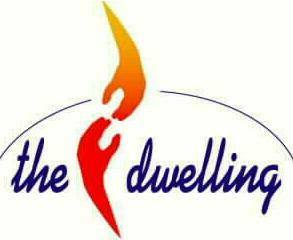 The Logo captures much of the ethos of The Dwelling: 24-7 Worship. We see the hand or the Spirit of God and the hand or spirit of man reaching out to each other. The hand representing man is a mirror image of God’s hand because our reaching out to God in worship is essentially a reflection of God first reaching out to us. We express our love to God through our worship because he first loved us. As our spirit touches God’s spirit in worship and the fire of God’s Spirit ignites ours in a passion of love and devotion, God makes his dwelling in our midst, within the sphere of our dwelling place. The three basic elements of fire, earth, and water are found in the design of this logo. The fiery work of God’s Spirit not only transforms the heart of the worshiper, but as he makes his dwelling among us, the fire of God’s spirit carried in the heart of the worshiper becomes a transforming influence in the earth: in all aspects of our culture, society and environment. The words "the dwelling" are in blue, representing water, and even the formation of the letters appear like waves on the sea. 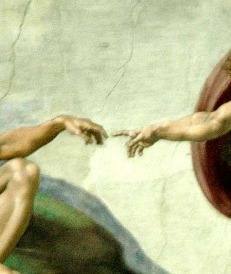 The logo was inspired by Michaelangelo’s "The Creation of Man" (Sistine Chapel, 1508-1512). We recognize and welcome the creative gifts God has given us throughout history: from the creative gifts of skilled craftsmen in the construction of the tabernacle (Ex. 31, 35, 36) to the instruments of worship used by God’s children throughout the Old Testament (Ps. 150), to the creative genius of the Renaissance period, to the resurgence of new and creative expressions of worship today. Our worship in all forms and creative expressions builds a welcome place for his Dwelling: in our Churches, in our homes, in our places of work or leisure, in our cities, in all spheres of society and culture and in the land itself.